This cap is Edwardian but the style is the same as in the Victorian period. During the 19th century everyone, including children, wore hats in all seasons. Hats were worn as a sign of respectability, as well as for the more obvious reason of protecting your head in all weathers. Men and boys would remove their hats when they were indoors and raise them as a sign of respect when they met certain people. Now most people only wear hats if it is very hot or very cold and on special occasions like weddings. 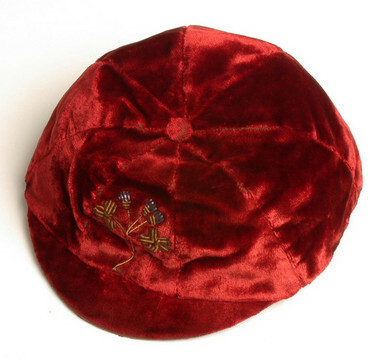 The cap is made from red velvet, which is quite a smart fabric, and has a small stem of flowers embroidered on the front in metal wire. Poorer boys would have worn caps made from much heavier and plainer fabric, and they would not have been decorated like this one is. The cap has a very narrow peak - not like the large peaks on baseball caps nowadays!